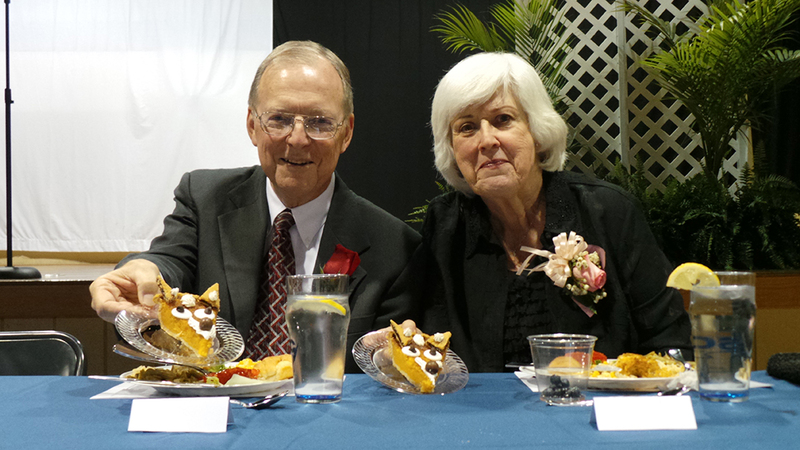 Leon M. Fox, Jr., the 37th Honorary Chair of the Southeastern Community College Foundation Dinner Theatre, was joined by a record number of SCC retirees, friends and family in a celebration on April 9 that drove home the importance of Lonnie’s contributions to SCC and the SCC Foundation. Sue Hawks, executive dean of institutional advancement, extolled Fox’s past and present role as a valued SCC employee of 34 years and his continued importance as a Director of the SCC Foundation Board. With the naming of the Fox Family Nursing Scholarship in 2011, the Fox family’s future involvement with SCC is assured. The first three Fox Family Nursing Scholars, Amy Clemmons, Kristi Johnston and Megan Bailey, spoke of the success that they have enjoyed and will continue to achieve as Associate Degree Nurses, thanks to the two-year scholarship that each student has received. Dr. Brantley Briley, SCC’s seventh president and currently the president of Lenoir Community College in Kinston, spoke of Lonnie’s importance to SCC. “When I became President of SCC in 2000, I was relieved to have Lonnie in the position of Vice President of Operations and Finance. It was my first presidency and the transition was made seamless thanks to his expertise. My biggest fear was that Lonnie would retire. My wife Eugenia and I loved living in Columbus County and have never enjoyed a college family and community more. You cannot replicate the friendliness and acceptance that we were welcomed with,” Briley stated. Fox was awarded a commemorative medallion by the Foundation to recognize the importance of the event. “Southeastern Community College has played a huge role in my life. I owe a great deal of my success to the people in this room. I am honored to be the first SCC retiree to be honored by the Foundation.” Fox said, “I always wanted this evening to be more about the college than about me. We all share in the success of SCC,” he concluded. With that statement from Fox, Hawks shared with the audience the success of the 2015-2016 Annual Fund Drive. With Steve Smith as this year’s Fund Drive chair, the goal of $200,000 has been far exceeded. The current Fund Drive total is $435,476. The total includes a stock gift of $150,000 from Chadbourn native Llelanie Sutton Orcutt, a $10,000 gift from Melba Lennon Hinson Williams allowing for the endowment of her trust and the naming of a scholarship in her name, and contributions from the many loyal supporters to the SCC Foundation. The good news continued as Kevin Butler of Duke Energy presented a check to SCC President Dr. Anthony Clarke and Board of Trustees Chair Henry Edmund in the amount of $249,526 on behalf of John Elliott, director of government and community relations for Duke Energy. The grant was co-authored by Vice President of Workforce and Community Development Beverlee Nance and Director of Industrial and Workforce Training Mark Lennon. The grant will be utilized to upfit a classroom that will prepare students for careers in advanced manufacturing. The Dinner Theatre concluded with ‘customized’ entertainment for Fox by longtime friend and entertainer Bill Thompson and SCC honor students and vocalists Mary Catherine and Elizabeth Axelberg. The SCC Foundation is a proud sponsor of the SCC Foundation Dinner Theatre. All funds raised by the non-profits efforts aid in the career goals of SCC students and the development of Southeastern Community College. Your gifts assure the success of your community college. For more information on how to support the SCC Foundation, please call Sue Hawks or Amanda Formyduval at 642-7141, ext. 320 or 260.